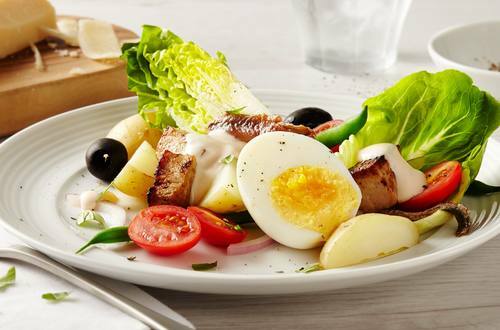 A classic Nicoise salad. The key to the great taste is to marinate the tuna in Hellmann's® or Best Foods® Real Mayonnaise, herbs and garlic before serving. 1 Combine Hellmann's® or Best Foods® Real Mayonnaise, 3 Tbsp. olive oil, red wine vinegar, parsley and garlic in small bowl. Spoon 1/2 of the mayonnaise mixture over tuna in large, shallow nonaluminum baking dish or plastic bag; turn to coat. Cover, or close bag, and marinate in refrigerator 1 hour. Refrigerate remaining mayonnaise mixture. 2 Remove tuna from marinade. Heat remaining 1 Tbsp. oil in small skillet over medium heat and cook tuna until desired doneness, turning once, about 5 minutes. Set aside. 3 Arrange lettuce, onion, tomatoes, potatoes, green beans, eggs and tuna on large serving platter. Top with olives, anchovies and basil. Drizzle with refrigerated mayonnaise mixture.